What a happy and handsome boy you are. Dearest Nova, you are adorable! What a precious little Guinea Pig you are, with that beautifully-colored fur and sweet face. You have the most delightful personality, too. You love to eat, and you love to popcorn when petted. You've also done quite well on long car trips. You can be lovable but quite naughty, and that just makes your dear person love you even more! You two have been through a lot together, many transitions, and you're still the same little boy as ever. You were the best birthday gift ever for him/her! You love each other very much, don't you. What a wonderful love-filled home you share! 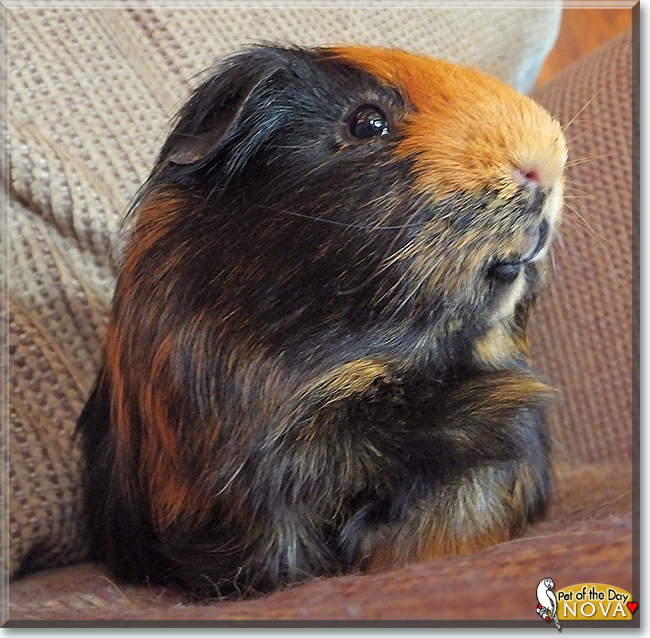 Congratulations, darling Nova, on being chosen today's Pet of the Day! We hope you and your dear person and all your family and friends are enjoying a fine celebration, full of fun and lovies and all your favorite games and treats. Hi Nova, best birthday present EVER! Happy Pet of the Day! Zing went the strings of my heart the second I laid eyes on your gorgeous wheeker self! What a handsome boy you are, Nova, so sweet and laid back, with just enough *spice* to make life interesting...for your human! hehe And you're quite the adventure loving, road traveler to boot we hear...Wow!!! Yellowstone! Having been mom to cavies for many years,I know just how special you kids are, and what a gem your human was blessed with the day she was gifted you! Through all of the transitions, the ups and downs you've been there for your human and she for you! What a team! How lucky your mom is, having a beautiful, joyful, sweet and loving furry family member in you, sweetheart! You truly are a treasure, just as special as can be, simply the best! Thanks for the BIG smiles, sweetheart! Meeting you today has been a joy! Meeting you today, being treated to your heart-melting photos has been a joy! I hope you're enjoying a very special day of celebration...treated to tons of extra floor time, popcorning to the max; munching on yummy fruits and veggies; cuddling with your human; being loved and pampered to pieces! Lots of love, cuddles and kisses to you, precious Nova, our very special and most deserving Pet of the Day, EVERY day! What a handsome Guinea Pig you are, Nova. Your beautiful coat is so colorful. You love to go on car trips with you human.